Novel physical solutions, including new results in the field of adaptive methods and inventive approaches to inverse problems, original concepts based on high harmonic imaging algorithms, intriguing vibro-acoustic imaging and vibro-modulation technique, etc. were successfully introduced and verified in numerous studies of industrial materials and biomaterials in the last few years. Together with the above mentioned traditional academic and practical avenues in ultrasonic imaging research, intriguing scientific discussions have recently surfaced and will hopefully continue to bear fruits in the future. The goal of this book is to provide an overview of the recent advances in high-resolution ultrasonic imaging techniques and their applications to biomaterials evaluation and industrial materials. The result is a unique collection of papers presenting novel results and techniques that were developed by leading research groups worldwide. This book offers a number of new results from well-known authors who are engaged in aspects of the development of novel physical principles, new methods, or implementation of modern technological solutions into current imaging devices and new applications of high-resolution imaging systems. 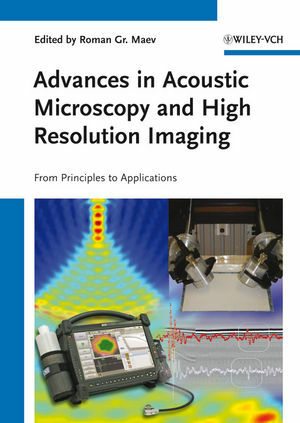 The ultimate purpose of this book is to encourage more research and development in the field to realize the great potential of high resolution acoustic imaging and its various industrial and biomedical applications. Roman Maev is a celebrated academic scientist, scholar and administrator. He is founding General Director of The Institute for Diagnostic Imaging Research in Ontario, a multi-disciplinary, collaborative research and innovation consortium. His research interests include theoretical fundamentals of physical acoustics, experimental research in ultrasonic and nonlinear acoustical imaging, and the theory of propagation of waves through layered structures. Professor Maev has published 13 books, over 320 articles, holds twenty-three patents, and received numerous awards.